Was Gagarin the first? Or just the first to survive? Lieut. Ledovsky died in 1957 on a brief suborbital spaceflight from the Kapustin Yar rocket base on the Volga River. Cosmonaut A Shiborin was killed the following year on a similar mission when a parachute failed. Lieut. V Mitkov died during a third ballistic flight in 1959. A fourth cosmonaut was successfully launched into space in May 1960, but a faulty retro-fire marooned him in orbit. In September 1960 Cosmonaut Pyotr Dolgov died in a launchpad explosion. On February 4, 1961, laboured heartbeats were heard during radio transmissions from an unknown Soviet Spacecraft. Several Cosmonauts disappeared around this time, among them Belokonev, Kachur, and Grachev. 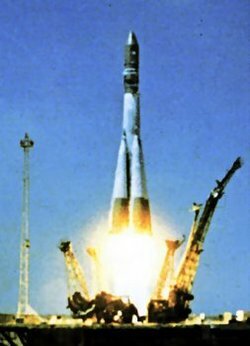 In October, 1961, a Soviet spacecraft with three crew-members went off course and left Earth orbit. In November, 1963 the Soviet Union attempted to launch a second woman into space. This ended in disaster when her Vostok craft allegedly burned up during re-entry. According to Italian shortwave interceptions, two Cosmonauts died during an unsuccessful space mission in April 1964.